it all started with Chrono Trigger...: The Xbox is Dead. Long Live the Xbox! So after a long and lengthy life snuggled up against our PS3, my Xbox 360 has decided that it’s time as a gaming machine is over. It will now live as a DVD player and Netflix streamer underneath the television in the bedroom. 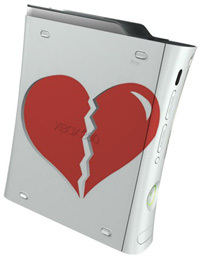 I know what you are thinking-did it go the way of all old 360’s and display the Red Ring of Death? Alas, no. That happened within months of owning it back in aught eight. This time it’s death pattern has emerged as an frustratingly random pattern of red light green light. When a game stops mid-play (red light! ), it doesn’t start again unless you completely restart the system (green light!). In games that auto-save this is merely annoying. In games that have random save points scattered across a map this is seriously obnoxious. But in games that require you to manually save, oh, whenever you remember or decide to stop (Bioshock 2, *sob*) this is a deal breaker. And before anyone offers any troubleshooting ideas, please know that we have tried them all. But all is not lost. We do have a second 360 in the bedroom (switcharoo from hers to his), so don’t feel too bad for us. But just know that all of my free time this weekend will be spent going through an EPIC list of Rock Band DLC and redownloading roughly 150-200 songs one by one onto a new hard drive. Thank goodness the most current games I play are on a memory unit. We wanted to upgrade to the Elite long ago, so it looks like this fall will bring us a brand new console with loads of space. But Godspeed, November 2007 360, and best wishes to you in your new life as a film projector. There may be a delay in new blog entries-not because of the 360 situation, but because I am actually nearing the end of FFXIII and want to keep the momentum going before starting something new. But ‘nearing the end’ could mean fifty more hours (I am currently on Hour 32) even though I have reached chapter 11 of 13. Next on my plate: God of War 3, Dragon Age, Splinter Cell, Red Dead Redemption & Alan Wake. Whew!